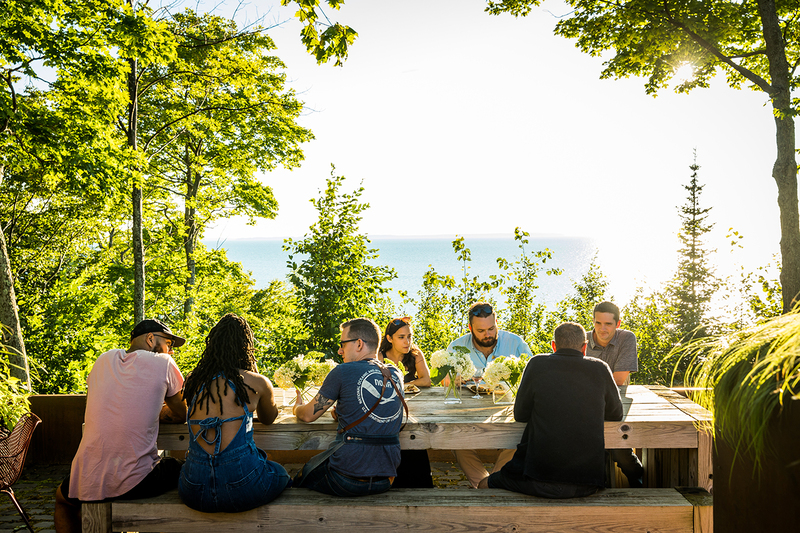 About 25 guests joined Baia Estate partners for a mid-summer Italian dinner party in Leelanau County, just a few miles from the Baia vineyard site on a stunning 100-foot bluff overlooking Lake Michigan. 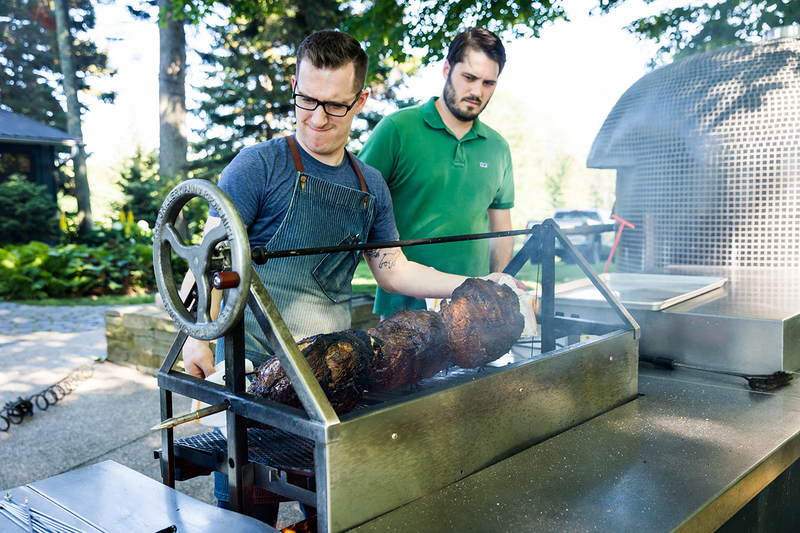 The meal was prepared by three-time James Beard Award nominee—and a partner in Baia Estate—Luciano Del Signore along with his friend and mentee James Rigato, an up-and-coming chef in the Detroit food scene and a former contestant on Bravo’s Top Chef program. 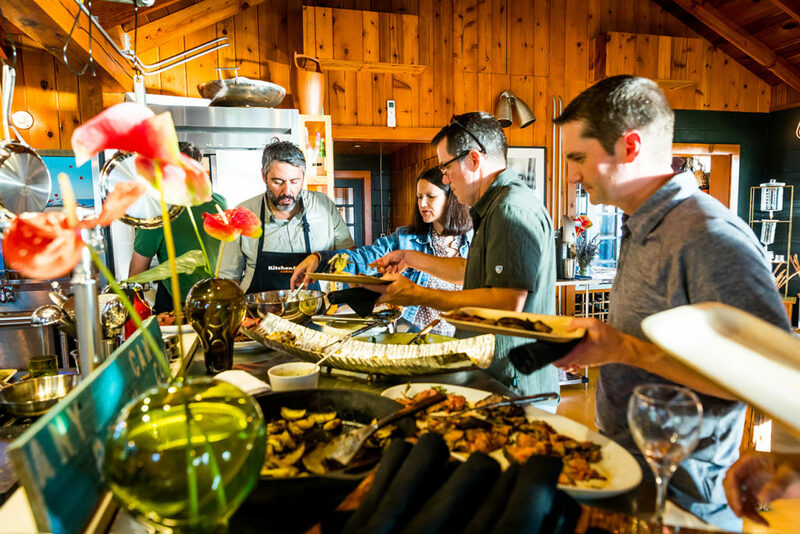 As the chefs and their staffs worked in the open-air kitchen, guests enjoyed a stunning antipasto array and refreshments from Baia Estate as well as Arbor Brewing Company, which has joined Baia as part of the growing Farm + Ferment venture group. Baia’s cool, crisp Pinot Grigio, Riesling, Chardonnay, Rosé, and the new “Bubbs”, a dry sparkling wine, were all delicious and refreshing on the warm afternoon. The dinner was actually a re-creation of a meal Luciano and James had prepared for a family celebration a year before in Abruzzo, Italy, the hometown of Luciano’s parents and a place the chef had visited often during summers while growing up in Detroit. “It’s a place where my love of great food and Italian cooking took hold,” Luciano said. That trip to Italy, the first for James Rigato, was filmed and turned into a 30-minute documentary, “Dinner in Abruzzo,” which was shown the following day at a film festival in nearby Traverse City. 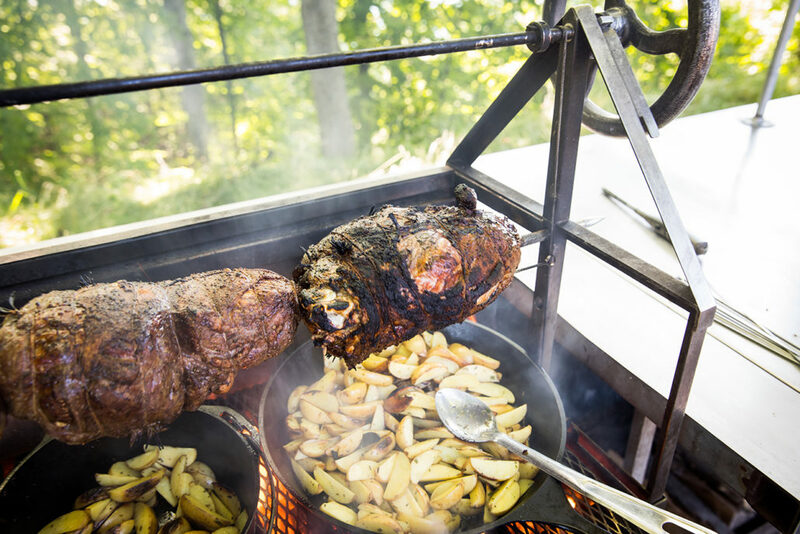 For the meal in Michigan, Chef James roasted legs of lamb on an open flame over large pans of frying potatoes to catch the drippings. He recalled he had to alter his cooking methods in Italy while preparing lamb chops the previous summer. “I had insisted on cooking the lamb to medium rare,” he said. “But I found that in Abruzzo they like their lamb either raw or cooked through.” He added that lamb is a sacred staple in the cuisine of Abruzzo. In Abruzzo Chef Luciano had prepared a Branzino tortellini, but for Michigan he instead roasted a whole fish, Orata, a bounteous and highly-prized fish throughout the Mediterranean. To go with the meal Chef recommended the Baia Bubbs, which is made in the Prosecco style from a locally grown semi-dry Riesling. He noted that a wine can only be legally named “Prosecco” if it is made in northern Italy from the grape varietal Glera. Luciano added that Baia wines have been “very well received” at all of his restaurants, including his flagship Bacco Ristorante. “And Baia is killing it at Bigalora,” a group of now six restaurants that feature wood-fired Neapolitan-style pizzas and casual Italian dining. The Bigalora Wood Fired Cucina restaurants are also part of Farm + Ferment. www.bigalora.com. The relaxing day celebrating great Michigan wine and a rustic Italian feast could not have been more perfect. 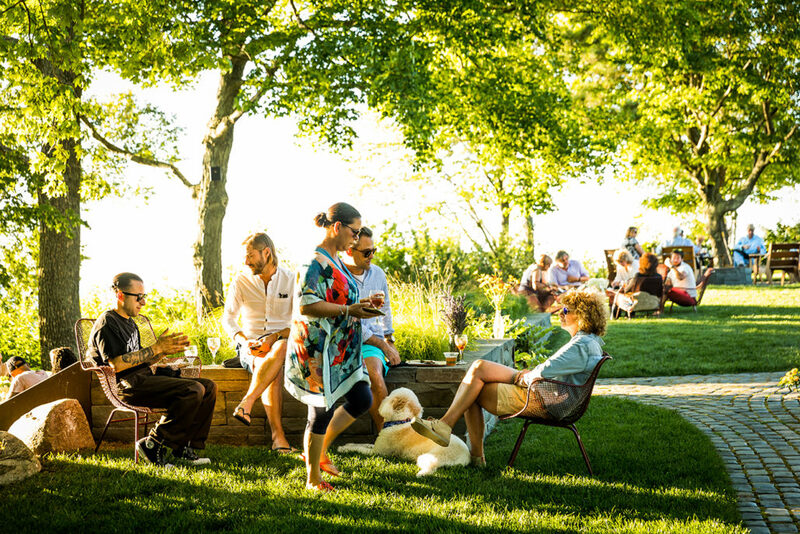 With the waves of Lake Michigan nudging against the shore far below, and the grapes for the next Baia vintage ripening on the ridges above, guests reveled until well after sundown, which in mid-summer in northern Michigan does not come until 10 p.m. Cin-Cin! © Copyright Baia Estate. All rights reserved.